Ion exchange is a reversible chemical reaction where dissolved ions are removed from a solution and replaced with other ions of the same or similar electrical charge. 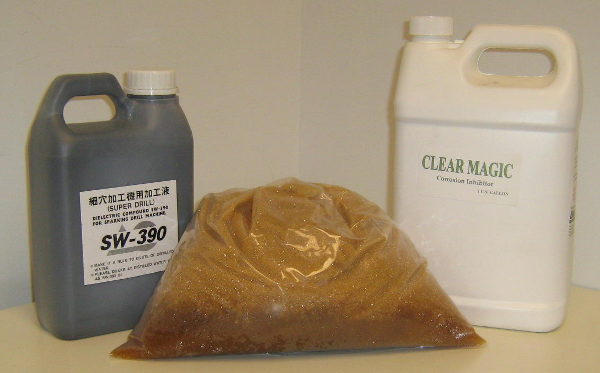 Deionized resins are regularly utilized in EDM applications to effectively remove the impurities of the fluids that are used during the cutting processes. Contact McWilliams Sales & Service for more information regarding our EDM resin removal process, or call us at 1-888-336-7453 with any questions that you may have. How Does an Ion Exchange Resin Function? Ion exchange is the swapping of a reversible interchange of charged particle ions with those of a like charge. The resins ultimately function this way due to their functional groups, which are permanently bound within the polymer matrix of the resin. The charged ions are then more or less programmed to then bond with ions of an opposing charge. The opposed charged ions are then delivered through the application of the resin base until equilibrium occurs. As a rule of thumb, the greater the size and/or valency of an ion, the greater affinity it will have with ions of an opposing charge. After the initial EDM resin removal process is complete, and all contaminant ions have bonded with all the available exchange sites within the deionized resin, it must be restored to its original capabilities through a resin regeneration cycle. Depending upon the type of resin and the application that is utilized, the regenerant may be a salt, acid, or a caustic solution. During the resin regeneration cycle the reaction process is reversed through the addition of a concentrated regenerative solution. The contaminated ions are then exchanged for ions within the newly added regenerative solution. The contaminated ions are then effectively flushed out of the system and the process can begin again. Effectively removes impurities within the fluid. Creates a longer fluidic life cycle. Ensures an optimal liquid ionization processing effect. Contact us for more information regarding our EDM resin regeneration process, or for an in-depth price analysis on ion exchange resins request a quote today.